Cognoa provides parents with an online evaluation for developmental delays and resources for improving children’s development. The company’s mission is to lower the average age of diagnosis for developmental delays and provide scientifically reliable information using big data and machine learning. I lead the design that evolved Cognoa from a transactional service to a community user experience with recurring engagement. My contributions increased new customer conversion by 100%. 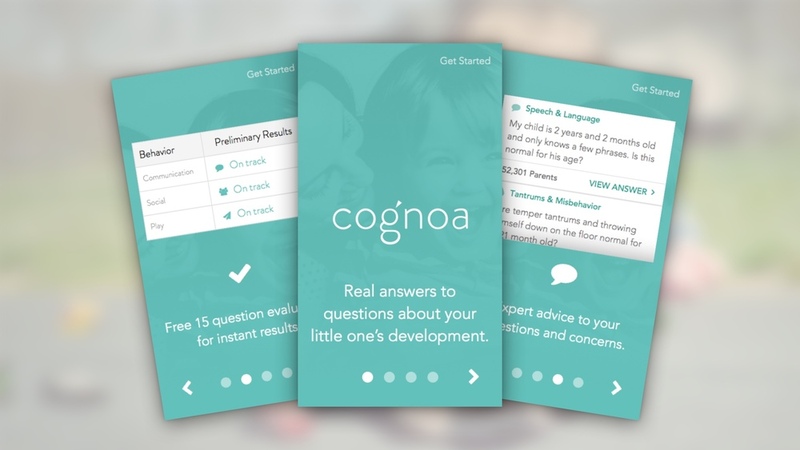 Over 100,000 parents used Cognoa’s web, iOS, and Android products in the first year and tens of thousands return each month to improve their children’s development. I produced thousands of mockups, dozens of prototypes, and released three applications. When starting at a new company you’re taking over the work of others and it can often be hard to find a place to start. Before getting excited to put my own aesthetic on a product I prefer to examine the nuts and bolts of the experience. To understand Cognoa’s product better I got it in front of parents and observed their behavior. The initial questionnaire was more challenging for parents than I expected. Confusing, scientific language and unnecessary interface components resulted in a slow, cumbersome workflow. To improve the flow I implemented an auto advance interaction that moved the user from question to question, instead of asking them to confirm each selection. I worked with our chief science officer to understand the language behind the questions that parents found most confusing. Together we came up with more accessible questions. I added images to provide context to the questions and tie a visual thread through the product. After improving the questionnaire I wanted to identify other pain points in the product. I implemented a tool called Delighted for tracking NPS. I often use NPS to better understand my customers and the success, or failures, of the experience I’ve designed. Within a few days of turning on NPS there was overwhelming evidence that there was a problem with the evaluation results. Primarily that a lot of our users were not receiving their results. My teammates didn’t know what was wrong, because there was no drop off in the conversion from questionnaire to results. Crazy! It turned out that a decision had been made to withhold results from users with low risk for delay in an effort to receive more video evaluations, a relatively new feature. This is a good example of balancing business and user goals and what happens when you ignore one. Results variations user tested with parents. Before the results had been withheld I was told that the score was shown on the results and that had been confusing and often misinterpreted by users. Given the clear product problem I wanted to release a solution as soon as possible. Fortunately I was set to attend Profectum, a conference on autism, a few days after this discovery. I created a wide variety data visualization that I then tested with parents I met at the conference. Ultimately the best solution was to clearly state whether we thought there was a delay or not and refrain from using graphs and figures that parents could misinterpret. I also found ways to use the parent’s other answers from the questionnaire to provide more information on their child’s development. Within two weeks of releasing the new results screen our NPS increased by 200%. Left: Results screen designed in first month. Right: Enhanced version released Nov. 2015. The solution I came up with was fast and not final. I continued to develop and iterate on the results, since this is currently the most important part of the experience for parents. Through user interviews I learned that parents wanted to know how their child’s results compared to other children of the same age. Making comparisons like this is natural but dangerous if positioned in the wrong way. Cognoa is often associated with bad, scary news. For many parents they’re scared of what the results will say, which can cause them to pass on evaluations. To make the results more positive, even for high risk children, I worked with our chief science officer to find ways to identify children’s strengths. I then designed a new results screen that displayed a child’s strengths along with context about other children of the same age. No Cognoa is moving away from the scary brand that tells parents their child is slow. Information available to our parents is misleading and often written by other parents. Parents come to us for an answer with the evaluation so we wanted to see what other questions we could help answer. Large number of questions in the beginning. We began to share the questions and answers back to the community and saw the number being asked drop. The goal is to alleviate parent’s concerns by providing clear, reliable answers. Within the first two weeks of launching the feature we received over 200 questions. To date we have received over 5000 questions. The rate slowed down as we began to feed common questions and answers back into the app. The insights gained from this feature led to the creation of the Cognoa Sleep Therapy program. iTunes App Preview created summer 2015.